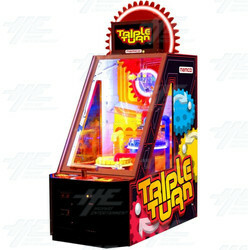 Triple Turn is a highly addictive new ball game that provides many opportunities for exciting game play and big ticket payouts. <b>How to Play:</b> Players must release a ball down the tube at the top of machine using a lever at the precise time to make the ball fall into the desired tube. Players must release a ball down the tube at the top of machine using a lever at the precise time to make the ball fall into the desired tube.